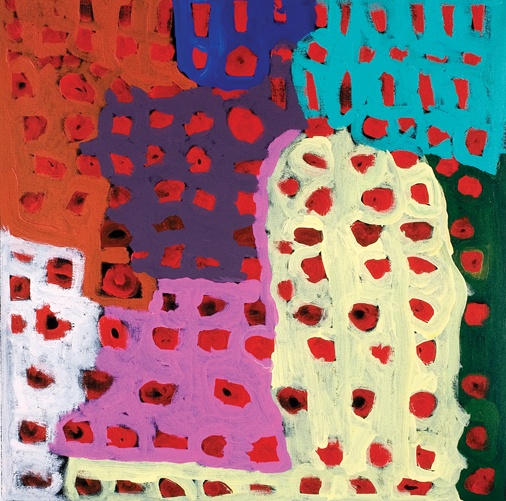 The following essay was written to accompany Bob Gibson Tjungurrayi: The First Solo Exhibition held at Mossenson Galleries, Perth, November 10 till December 5, 2009. The exhibition was presented in conjunction with Tjarlirli Art (Tjukurla, Western Australia). 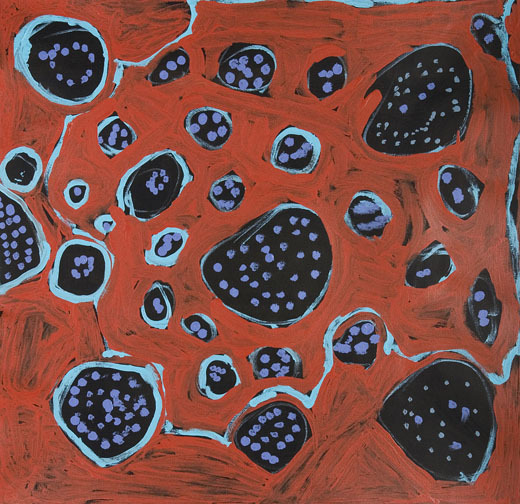 Bob Gibson Tjungurrayi, Walatu, 2009, acrylic on canvas. 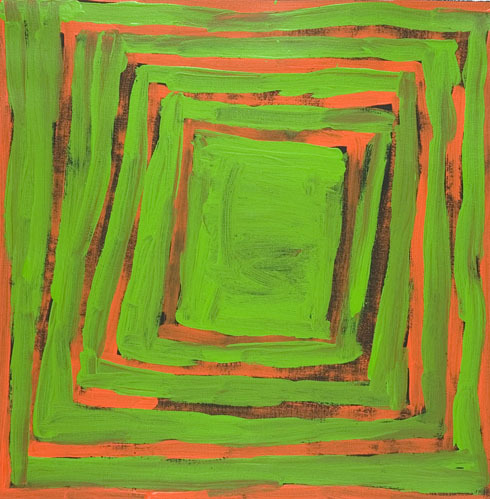 In a haze of incandescent orange and green, a series of concentric squares pulsate with the searing heat of the Western Desert. The colours meld and overlap, creating a transparency of paint that flutters across the ground of the painting. These are the designs of the Tingari ceremony – secret men’s business that takes place near the remote community of Tjukurla on the edge of Lake Hopkins. Each square is roughly painted, revealing the artist’s hand as it moves with a gestural intensity across the canvas, giving them a pulsating irregularity. These works sing of the majesty of the Western desert with a tongue rough-hewn by the shifting sands. Bob Gibson Tjungarrayi was born at Papunya in 1974, before moving with his family to Tjukurla during the time of the homelands movement. The son of renowned artist Mary Gibson, Bob paints his ancestral stories with a raw intensity. His palette of wild hues reveals an unrestrained joy for experimentation, tempered with nostalgia as he recalls his father’s country around Patjarr and his mother’s country of Kulkuta. In Bob Gibson’s paintings, the raw, physical experience of country is transmuted into paint. Underpinning this representation is the attendant spiritual and cultural knowledge that informs the Anangu view of the landscape. Gibson’s works are not simply unmediated depictions of country, but integrated and resolved extensions of cultural knowledge. His works are filled with uncanny, indefinable artistic allusions – whether the rigid Tingari of Ronnie Tjampitjinpa, the dense over-painting of Lorna Fencer Napurrula or the fiery brushwork of Johnny Warangkula Tjupurrula. Each is transformed into Gibson’s personal style. The artist’s hand becomes an expression of the cultural continuum, picking up on a wealth of knowledge and influence, and using it to create something entirely new. The Dreamings that underpin Gibson’s ancestral country are brought forward via his unique painterly style. This double-take between the familiar and the idiosyncratic is the central tension that drives the work. This distinction between the shared/communal cultural experience and the highly personalised artistic vision – between the iconic and the aesthetic – creates a visual metaphor for the difference between ‘seeing’ the country and ‘knowing’ the country. This latter form of viewing is not the unmediated sight of the tourist or visitor, but rather, the informed understanding of an initiated viewer. It sees beyond the physical manifestations of the landscape, focusing instead on the underlying spiritual dimension. This is why, under Gibson’s hand, the Dreaming sites at Lake Hopkins can be portrayed in such a myriad of ways, each revealing a different aspect of this sacred geography. For the Western viewer this is a highly challenging visual problem. After four decades of the Aboriginal art movement, there has developed a familiarity with the classic iconographies of desert painting, along with its predominant artistic styles. Some may even consider themselves ‘connoisseurs’ of Aboriginal art, able to rattle off the names of collectible artists from every corner of the country. And yet, what is this but the superficial frosting of a market driven appetite? Perhaps all we can see are brush-strokes on the canvas, the expressions of a profound knowledge of which we will never truly comprehend. The secrets of the Tingari remain hidden. In the work of Bob Gibson we find an invitation. Gibson’s paintings are all about inter-relation; of colour and form, of tension, reaction and interplay; the challenge of raw brushstrokes against flat planes of colour. They are a celebration of individual expression within the cultural continuum. In doing so, they ask us to question the nature the aesthetic, the very ways in which ancient iconographies can be remodeled and innovated, and show us how one artist can create a unique artistic statement, while remaining true to their ancient cultural knowledge.